A plant based diet reverses most diseases according to the biggest scientific dietary study ever done. It has been described by the New York Times as the Grand Prix of epidemiology, and it is without any doubt most extensive scientific dietary study ever conducted with over on 1 million people involved. 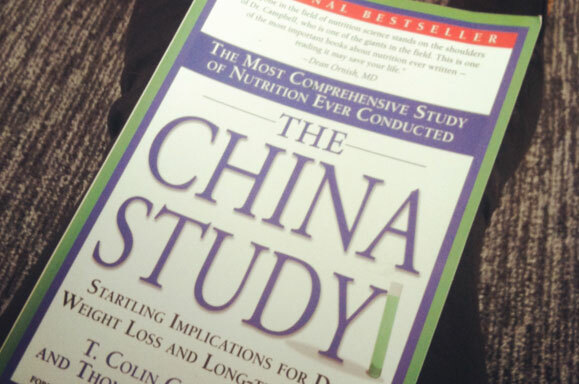 Its called the China-Oxford-Cornell Study , conducted on on dietary, lifestyle and disease mortality characteristics in 65 Rural Chinese Counties! The study was mainly lead by Dr. T. Colin Campbell, Jacob Gould Schurman Professor Emeritus of Nutritional Biochemistry at Cornell University and Thomas M. Campbell II. A disease is exactly what the word suggests it to be; a diss-ease in the body. When the body is at ease and is provided with the right nutrients and cofactors (helper moelcules), it can take care of pathogens and abnormal conditions & heal itself at its best capacity. To fully understand the capabilities of our immune system, one has to put in to perspective that it is the result of about 60 million years of biological evolution; since the emergence of the first primates. Even though the modern human body as it looks and functions today started to develop some 200 thousands years ago, it is still a result & fin-tune of the primate immune system & it is the major survivor & thriver of the entire evolution of life on Earth, up until this present moment. It has been through immunologic attacks from countless numbers of pathogens for millions of years and have developed into a perfect self-healing system that is fully capable of taking care of itself and prevent diss-ease with the assistance of various plants which it has evolved a close relationship with through the process of co-evolution. A plant based diet provides us with a complete protein & amino acids profile in the form that is most easily absorbed by the body & the metabolic system. A plant based diet also provides us with a healthy & balanced mix of different carbohydrate variations and simple sugars consisting of fiber, fructose, glucose and sucrose. Which in the raw , unprocessed & fresh form of it always comes as healthy mix & balance that does not cause insulin peaks (eventually causing diabetes) and other unnatural irregularities and imbalances. This is why you can not get fat or boos diabetes by eating fruit in its raw & fresh form. A large & imbalanced intake of any of these sugars alone on the other hand does cause further imbalances; such as diabetes or candida overgrowth and so on. Sucrose in its pure crystalline form is the processed, industrialized sugar that we buy from the supermarket (a.k.a table sugar). The same goes for high fructose corn syrup, and all other modified, imbalanced & industrialized sugars that are added to processed foods. A plant based diet also make sure that we have an intake of all the essential fats that we need. Fats that are soluble at body temperature (like coconut oil for example; unlike all land living animal fats!) and hence; not causing clogging in the veins. Plant based fats also in many cases a perfect balance of the omega-3, omega-6 & omega 9 oils and the fat soluble co-factors, vitamin A, D, E & K, all necessary for the immune system to function properly for the prevention of tooth decay..
A plant based diet that is not sterilized, pasteurized, industrially washed or cooked provides us with all the vitamins, cofactors & nutritions needed for the body to function as it should (yes, including B-12!, comes along with the healthy bacteria living on on the fruits, veggies, herbs & seeds) . IN SUMMERY ; A plant based diet gives us a balanced & healthy protein, carbohydrate, fat and co-factor profile consisting of all the vitamins, minerals & other help molecules that the immune system needs to be able to function as it should. This is everything that the body needs to be at ease, and it comes without any substances that would confuse our immune system. Animal products contain animal hormones, neurotransmitters, cytokines and other animal signal & regulatory molecules that are part of the animal immune & biochemical system. Substances and agents that are very similar to the native human version; but not exactly the same. This causes a serious confusion in the metabolic processes in general and the immune system in particular; and in the long run leading to autoimmune and other diseases. To have foreign signaling and regulatory agents present in our bodies is comparable with the scenario of having multiple similar looking keys for a certain keyhole, when only one of them is the perfect match for the keyhole. Instead of the efficiency of just using that key that works; one has to try them all; one of the keys will work but most of the other keys will only work halfway through only to get stuck, perhaps break & cause blockages and confusion in the system. It works in a similar manner in the human body. This requires a tremendous amount of effort for the immune system in particular & the biochemical system in general to focus and work on. These systems will have to put so much energy and effort in cleaning, re-organising and trying to unwind the confusion that they will have very little energy and effort left to put in to fighting pathogens. Also; we will be affected by the direct hormonal impact on the animal that we eat; which mostly depressed animals with depression & fear hormones present in their bodies. This is why fish & chicken in general are the “less harmful meat alternative”. Their system is slightly more different from the humans system and cause LESS but nevertheless a still great amount of confusion. 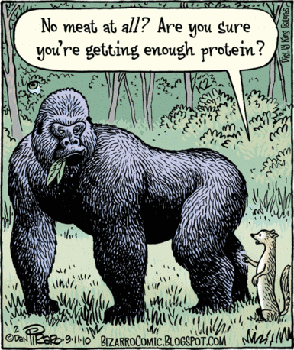 Animal proteins are the most densely packed source of proteins, coming in the form of muscle fibers. The protein in meat comes in the form of is peptide chains twinned togethers into greater and greater bundles , just like the thin threads that are used to make thicker ropes. It is a massive amount of proteins and it take a huge effort and energy for the body to digest and it releases a lot of ammonia rest products that not all of it can be taken care of by the uric cycle.This is why eating a lot of densely packed proteins (primarily as meats, but also dense beans & lentils) make you feel tired. You can ream more about proteins in a dietary aspect here. Animal products lack the amount of healthy carbohydrates that the body needs. This is why it always meals with animal products are complemented with processed and/or industrialized sources of carbohydrates & grains such as processed pasta or noodles or industrially produced rice. Below is a good video that gives an insight (literally!) to how processed foods affect the digestive system. Animal fats are the most cholesterol-rich source of fats that you can imagine. Animal fats are produced in the animal body to be stored as a source of energy for the body. Thus they are made to be in a solid in and around body-temperature. This is why animal fats also cause clogging in the veins; leading to cardiovascular diseases such as stroke, atherosclerosis and peripheral artery disease. Again, this is why fish is considered to be the more healthy meat alternative. Not all, but most fish are so called ‘cold blooded’ (ectothermic) , which means that they adapt their body temperature to their environment. Most solidified oil has a melting temperature of between 30° C — 38°C, and is thus soluble at human body temperature. This is why it is considered to be the healthier alternative. An animal based diet lacks the full spectrum of cofactors. This is why an animal based diet has to be complemented with a ‘proper salad’, which is just a some what reducing word for raw plant-based ingredients. Through a unprocessed (raw!) plant based diet; we can supply the body with everything it needs (nutrients, cofactors & medicinal substances) to keep the metabolic and biochemical machinery working without friction and as efficiently possible; and thus prevent diss-eases at its best capacity. If we constantly, on a daily basis, put biochemical debris & foreign unnatural substances in our body that confuse the immune system, as we do when eat an animal based products; we will create diss-eases in the body. Diseases that are not obvious immediately, but eventually will take their toll such as cancer, stoke and various other cardio vascular and autoimmune diseases. M.Sc. in Biochemistry, creator of Iterated-Reality.com, intuitive energy worker, conscious visionary and entrepreneur. Previous education, research & work involves; In vitro evolution of regulatory proteins at the Dept. of Biochemistry at Uppsala University. Market Analyst & Consultant at GE Healthcare, Product Manager at Isconova (Vaccine Adjuvant Supplier). Initiator & co-creator of Earthship Biotecture Sweden & Earthship Biotecture Europe. A graduate from the School Of Entrepreneurship at Uppsala University and the Swedish University of agricultural Sciences. 12 years of independent public interest research and analysis.